Here's another handful of non-human mechs. CRUB by 1000Nuglets. This one looks to based on the Hero Factory Mask, Insect. 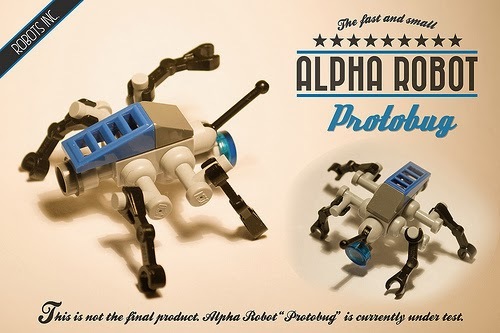 Alpha Robot Protobug by AlexNidhogg. 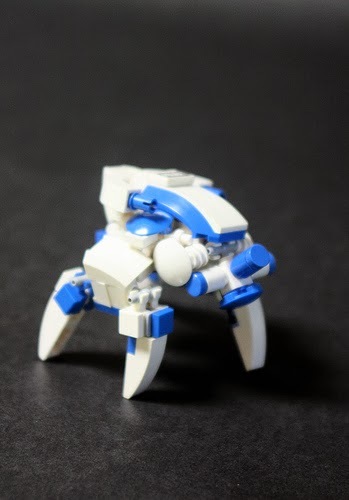 Tiny, but could be part of a swarm or dispersed systems mech. IMG_0357 by Simmon12. Looks good for another Ijad variant. I really like the Travis brick at the front with the 1x1 Round bricks coming off it. незнакомый by 1000Nuglets. The title is the Russian word for unfamiliar or strange. I think it fits. I'm continuing with my reviews of the Mixel line. This is Teslo, from the electricity tribe. He has 54 pieces for $4.99, which makes him $0.09 per piece. I mainly bought this one for that trans-colored "electricity" piece you can see on the front of the package. Here are the instructions and parts bag. That is a lot of Cheese Slopes over there on the left. I see some Clip Plates and Clip Bricks. There's also that neat "electricity" piece and the flexible small tubing too. And I would be remiss if I didn't mention the new ball joints and the small bow pieces. Oh, I almost forgot the "Ice Cream Cone" in Black. Forget ice cream cones, that's a ready made microscale gun muzzle. Here we go. A little something in 4P scale as a proof of concept. You're still left with plenty of parts to monkey around with too. Score: 20 (A+). Our third Lego set with an A+ rating and another Mixels set with the top rating. The title of this blog post was a saying I heard this weekend. It means that good fortune benefits all who are involved in a certain enterprise or area. I'd heard it before but I think it has more relevance after this post over on the Dark Cloud blog. I know he's kidding when he states we have a "rivalry". I hope people realize that and that any perceived rivalry is the furthest thing from the truth. I like the fact that I inspired him to write his own reviews of building block sets for MFZ. It means I have created something of value within the community through my blogging efforts. 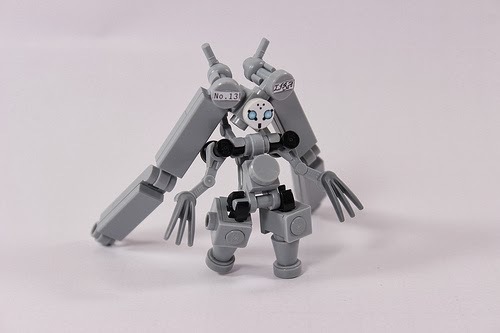 Along the lines of the title, here are a few blog posts that I've come across that only have a solitary mention of Mobile Frame Zero. I figure that maybe I can drive some traffic towards them by letting you know about them. Build / Paint /Play made one post about MFZ. This was back in 2012, then he never talked about it again. I hope he's still playing. Another one shot post about MFZ from Weasel Miniatures. 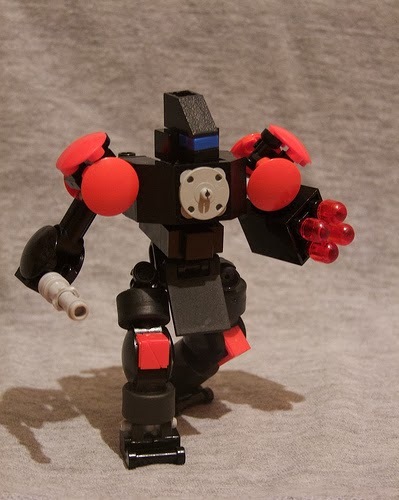 To Hit Arse Class 0 has a few posts mentioning MFZ. The Week's Work has a one-off post. Aaron's Gaming Blog has one too. Ludo Box has a couple of posts about MFZ. This is the only one to be found by tags. The others you have to look for. Apparently the blog is written by Ybliss. So remember, more views for me is more views for you is more views for another person. The MFZ community rises and falls together. Spread the word so we can all rise. The first time I did this I was comparing the prices of several sets in two different lines from Lego. This time around I'm just going to be looking at one, the Lego Movie line. All of these sets feature some wacky combination of genres, like the way we used to build when we were kids. This leads to a wide selection of parts in each set. And, to top it all off, more than half of the sets feature a Price-Per-Peice lower than the Golden Ratio. All the information has been pulled from Brickset this time around as Bricklink still has not completed inventories on some of the sets in the line. So, if the average price-per-piece of the line is $0.09, why can't Lego do this with more of their sets? I can understand Star Wars and the superhero sets being expensive as you have to pay off licensing fees. The City line, on the other hand, has been ruinously expensive lately and that makes no sense at all. Anyway. If you see these sets on sale, buy them. Eleven of thirteen are at or below the Golden Ratio. How can you go wrong with that? I haven't done one of these since last year. So here are a few new mechs for you to ponder. Gorilla Mechanoid Mk.II by Captain Moebius. Pretty beefy. A good way to start this line-up. Battle Frame UB-30 "Brawny" by Djordje. 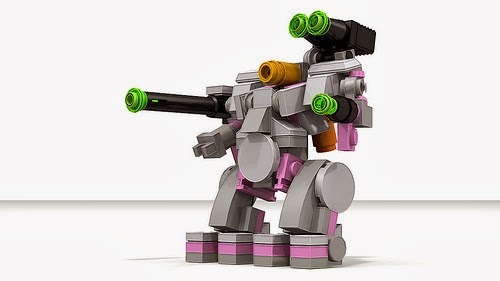 Maybe a little big for MFZ, it has some clean Battletech-y lines and some neat techniques. LIRA by SageThe13th. Freaky looking -- in a good way. Maybe a little small. Terranax Liberators Model R2 by Captain Foo. A render. Great use of color in this one. 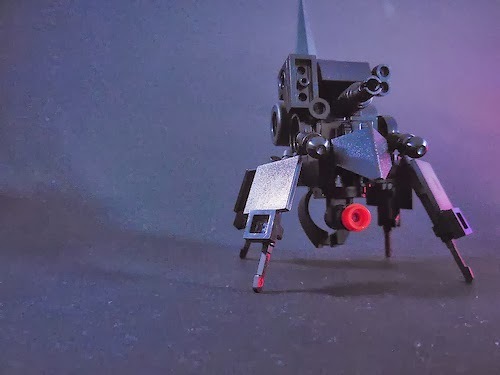 High Speed Combat Mech by SmellSterns. This one looks a little on the large size for MFZ. But if you chop the legs down a bit he should fit. I see some Zizy influence here. I pay attention to the search terms that are used to find this blog. It has lead to some interesting ideas. One of which is this post. A few people on the Hangar have mentioned having trouble designing Single Shot Rockets (SSRs) to go along with their MFZ companies. So with this post I'm going to show you what I built for several companies of mine. Six frames, six different SSR designs. Let's face it, this one is cheating. It's a ready-made Kre-O piece that just clips on. It fits the Drache Ei frames so well though! The only problem I might have with it is that it blends in a little too well and could possibly be missed when looking at the frame. I try and be simple when making SSRs. If you count the mounting piece I don't go higher than four pieces when making them. One thing I try to do is make SSRs that are distinct from the colors and shapes of the frames they are attached to. Especially with this one as it's attached to the weapon carried by the frame. This is meant to resemble a shoulder-fired, vertical-launch missile. It might blend in a little to the frame it's mounted to though. Another like the previous. It stands out from the frame though. This is the one I'm most proud of. I took an essentially useless minifig accessory and turned it into something that is recognizable as a SSR. So there you go. Six different designs, all pretty simple in execution. Guess what hit the shelves?!? Mixels are finally here. I bought two, and I'll be reviewing each one separately. They come in three main colors, Red, Yellow, and Black, with three individual models in each color. Each one is $4.99, which makes this $0.08 per piece. All the sets have a different piece count. The parts spread out. First of all is the two new ball joint holders in the lower left. We have a bunch of vertical and horizontal clip plates, cheese slopes in two colors and a hinge plate are always good parts. The two "eyeballs" in the middle are neat, as is the 2x2 round tile with artwork on it. Here's the frame I designed. Not great but I was in a bit of a hurry. Score: 20 (A+). Our second Lego set with an A+ rating. I get the feeling that more Mixels sets will achieve this rating. Hard to believe it's only been three weeks since the first Egg Walker post. I've made a few more of them since then. I have three regular versions and one tall one in the standard white with accents color scheme. I've made enough of these that I've actually run out of White 2x2 Round Tiles. Plus one tall one in black. This one actually has Attachments! I'd stat this one up as 2Rd+8 (gun) /2B (shield) /2W. Flickr page. I also have a new version that has movable legs. It also has a redesigned cockpit area and the legs are slightly different beyond the fact that they can be moved. Flickr page. Here we see the beginnings of "Over Easy Company". They're not fully equipped, but I'm working on it. I have a lot of tablescraps lying around in a plastic tub. One of them was a little starship. With the advent of rules for Mobile Frame Zero: Alpha Bandit I began thinking about it as a model for future games. It's very swooshable and about the proper size for MFZ: Alpha Bandit. The only real problem is the lack of attachment points for Attachments. So on we move to version 1.1. It looks a little better. Unfortunately the center piece has been replaced by two pieces and each Long Technic Pin only goes through one. This means that the core is kinda floppy. This brings us to version 1.2. We're back to one center piece and rigidity. The "bridge area" is more visible in this version. We're still left with the question of how to attach things. The other problem which I haven't mentioned is the lack of mounting points for the flight stand. You bump it and it will fall off. Less of an issue, but still somewhat, are the colors. 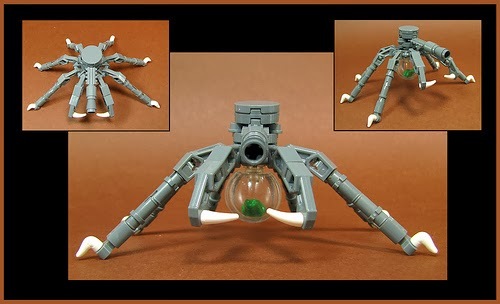 Dark Green pieces in the fiddly bits that microscale builders like to use are not that plentiful. Still, it's a fun creation and I look forward to using it someday. Here's a shot of a pair of them showing off attachments on either side of the hull. Here's the polybag itself. Surprisingly, this was originally released in 2011. I believe I picked this up for $3.99 at Target. Which means it's $0.13 per piece. Instructions and minifig. Nothing special here. Parts. I mainly bought this for the Modified Plate 1x2 w/Bar,the Technic Axle and Pin Connector Angled #1, and the Modified Plates 1x1 w/Vertical Clip in blue. Here's the 4P Frame and station I built from the set. You can see the leftover pieces in the foreground. I'd start statting the frame with 2Rd (gun) / 1Y (radio) / 2W. Score: -5 (B-). It's a decent set, the only things holding it back from a better score are the cost and inclusion of the minifig which takes up 20% of the parts count. 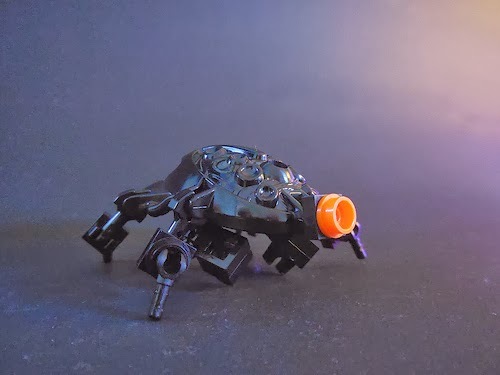 A few weeks a go I came up with a new method of building quad walkers. I think I discovered it while sorting. At this point I don't remember so I could be wrong. I feel the torso area of the model in the picture is still incomplete. I have an idea of the piece I would like to add, but I haven't opened the set it comes from yet. Right now the Inverted Slope 45 Deg. 2x2 could be considered the "face" of the frame. The frame design starts with the Technic Knob Wheel as the core with four of Modified Plate 1x2 w/Arm Up forming the starting point for each leg. The torso is then mounted via a Technic 1/2 Pin w/2L Bar Extension and a Technic Brick 1x2 w/Hole. The only problem with this is that you either have to leave the space above the brick empty or mount another one on the exposed stud. This does give you a place to mount future attachments though. If you place a Technic 1/2 Bushing on the bar section between the Knob Wheel and the Brick w/Hole, you can lift the torso up a little so it doesn't ride so low. You also don't need to use Hinge Plates to form the "knee" portion of the leg. You can use multiple Modified Plate 1x2 w/Handle on End and a Modified Plate 1x2 w/Clips Horizontal to make a couple of legs. I only have two and a half of these built so I'm still exploring options right now. Quad 1 Flickr page. Quad 2 Flickr page. You could almost consider this as shooting fish in a barrel. 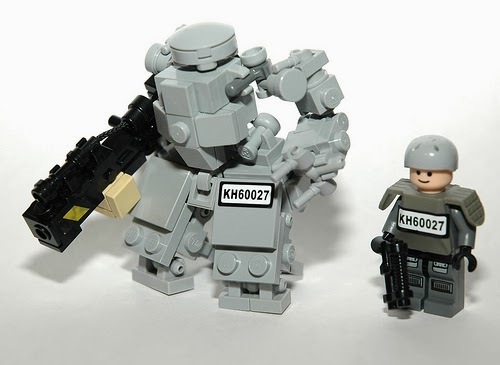 The Umbaran MHC polybag is essentially tailor-made as a set for MFZ. That being said, you can still build a lot more with it than the one mech that you are provided instructions for. Ground Attack Vehicle. Flickr page. These two can be built at the same time. Finally we have the Centaur Warrior. Flickr page. This one uses all the pieces from the polybag. 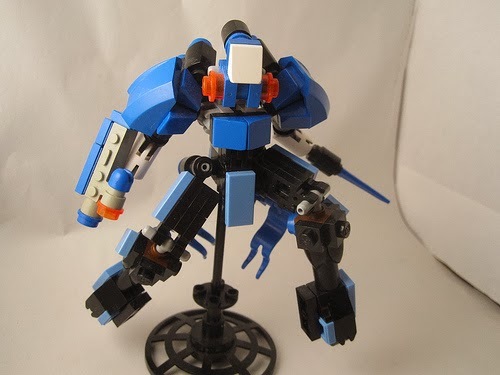 Stats for MFZ: 2Rh(staff)/1B(shield)/1G+d8(extra legs)/2W. All of these designs can be considered for MittenNinja's 3T Challenge as well.